In addition to congestion pricing, the Governor also outlined a set of proposed actions for the Legislature to establish accountability and fix a system that has been broken for decades. The proposals include improving processes for the design and completion of major projects, addressing the mounting budget and operational deficiencies, determining the cost of a real capital plan, and overhauling the MTA's archaic structure. "The MTA has been plagued by organizational dysfunction and disinvestment for decades, and we need better management and more money to turn it around," Governor Cuomo said. "Congestion pricing is the only logical and realistic option to fund the MTA's capital needs and one person must have the authority to make decisions, hire and fire, and reorganize. Let the Legislature cast their vote on the real choice - congestion pricing or 30% fare and toll increases. It's A or B because there is no C. If the public understands the critical choice their elected officials are making, congestion pricing will prevail." The MTA is in desperate need of a reliable funding stream to support its transformation and ensure annual budgeting. Given the lack of viable alternatives, the only real choice is congestion pricing. Congestion pricing would charge a toll for those entering the Manhattan Central Business District below 60th Street and raise an estimated $15 billion for the MTA's next capital plan. The Fix NYC Panel has a number of variable rates that would incentivize drivers towards non-congestion hours by reducing tolls at certain times and it would be implemented with electronic tolling. Funds would be put in a lockbox for MTA capital projects. Congestion pricing is the only logical and realistic option to fund the MTA's capital needs and one person must have the authority to make decisions, hire and fire, and reorganize. 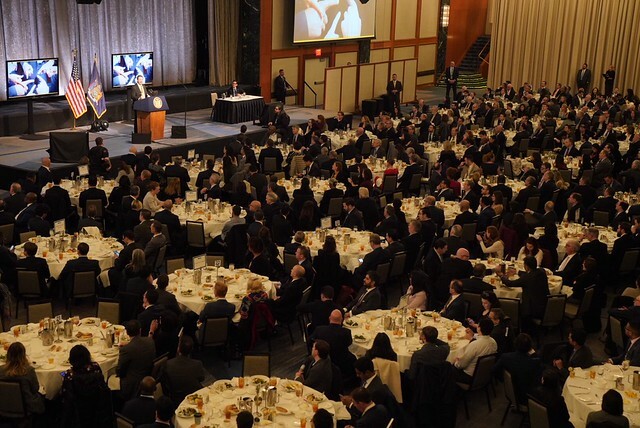 In his remarks, the Governor noted that congestion pricing would have minimal impact on commuters from outer boroughs. He cited data showing only a fraction of New Yorkers commute by car into the Central Business District, and 25 percent of commuters who would pay a congestion pricing fee are from out of state. 1. Pass Congestion Pricing: The MTA is in desperate need of a reliable funding stream to support its transformation. Given the lack of viable alternatives, the only real choice is between congestion pricing or a nearly 30% toll and fare increase and further deterioration. Governor Cuomo strongly supports congestion pricing, which must be passed by the State Legislature. Congestion pricing would charge a toll for those entering the Manhattan Central business below district 60th Street and raise an estimated $15 billion for the MTA's next capital plan. Ultimately, the decision lies with the Legislature, and the Governor is urging legislators, to make the decision between congestion pricing or imposing significant toll and fare increases or allowing further deterioration of the century-old system. 2. Implement Design-Build for All Projects: Governor Cuomo passed New York's first Design-Build Law in 2011. Design-Build - which combines the design and construction services into single contracts -reduces the bureaucracy and costs of major infrastructure projects, and shifts the responsibility to the private sector. New York State uses design-build for all major projects, including for the Governor Mario M. Cuomo Bridge, one of the largest recent public infrastructure projects in the nation, and the new Kosciuszko Bridge, which will be completed in 2020, a full four years ahead of schedule. MTA construction projects rarely come in on time and they don't use design-build, which is inarguably the most efficient construction method. The State doesn't do a major project that's not design-build. 3. Stop the Fare Evasion Explosion: The New York City Transit Authority has seen a recent explosion in fare evasion on the subway. In recent years, the number of toll evaders has doubled, costing the MTA a total of $215 million per year, an increase of $110 million in 2015. 4. Reorganize MTA Internally: Each MTA subdivision - including NYCTA, MTA Bridges and Tunnels, LIRR and Metro-North - has its own back office operations, including personnel, advertising, engineering, legal, accounting, and is made up of thousands of employees. The Governor believes this redundancy is a tremendous waste, that it is highly ineffective, and is calling for streamlining and better coordination. 5. Audit MTA Capital Plan: According to the working group, the MTA's five-year capital plan estimates range from $40 billion to $80 billion. The Governor is calling for a forensic audit to determine the true cost of a capital plan. 6. Reorganize MTA Board and the Unilateral Veto: The MTA board is comprised of 23 members; however, it gives no single person a clear majority of nominees. The Governor selects the Chairman and five other members, which does not provide a majority. Of the remaining members, the Mayor selects four and the regional County Executives outside of New York City select seven. Furthermore, the MTA Board itself does not control the agency's Capital Plan. Even after board passage, the Governor, Senate Leader, and Assembly Speaker are each able to veto all or part of the plan for the MTA at their discretion, and the Mayor is able to veto all portions of the plan for the MTA impacting the city at his discretion. An overhauled bureaucracy and singular responsibility would lead to crucial reforms. With authority clearly designated and funding secured, the MTA will be able to function as an efficient, effective, model for the world that New Yorkers deserve. 7. Congestion Pricing Lockbox: Create a lockbox of congestion pricing revenue dedicated to MTA capital only.